Exams are almost over and that means I’ll have more quality time with my kitchen. And since my kitchen has an even bigger sweet tooth than me, I’m forced to make something super sweet! I’m also super excited for Angies Fiesta Friday Birthday Party! Too bad my kitchen won’t allow me to participate in this weeks party because of the appetizer and starter theme. BUT I’ll be there to party with them, just not bringing anything. Is that bad? I’ll make it up to her next week because then the theme is main dishes and desserts. Indeed! I don’t need to tell you what I’ll be bringing, right? I’m brainstorming and planning about the things I want to make because this party is going to be THE party! 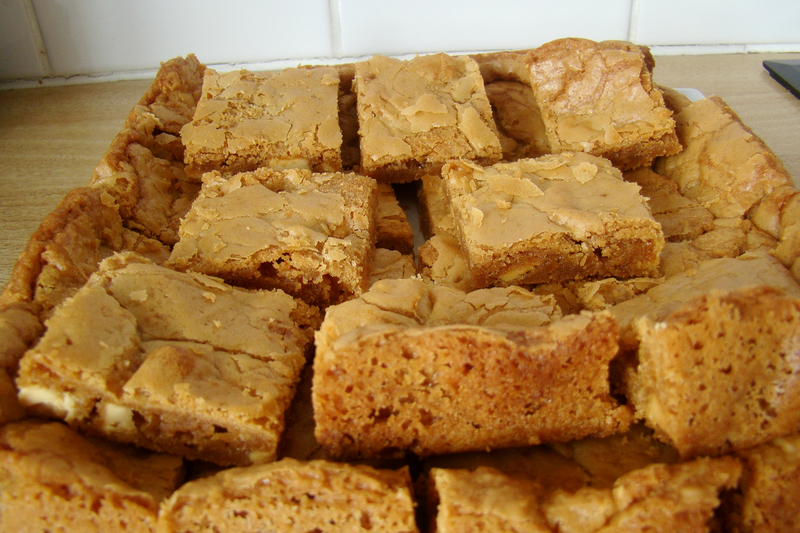 Today I’m sharing some super delicious Speculoos Blondies with you! I saw them last year at The Not So Creative Cook and I knew I had to make them! I can assure you, this definitely is a crowd pleaser! I’m using Jhuls’ recipe, because it was that good! Line a 8×8 or 9×9 baking pan with parchment paper or spray with nonstick spray. In a medium sized bowl, toss together the flour, baking powder, baking soda, and salt. In a large bowl, stir the melted butter and brown sugar together until combined. Stir in the cookie spread. Be careful not to overmix, which will result in crumbly, hard blondies. The batter will be very thick. The blondies may appear very soft, but they will set up as they cool. 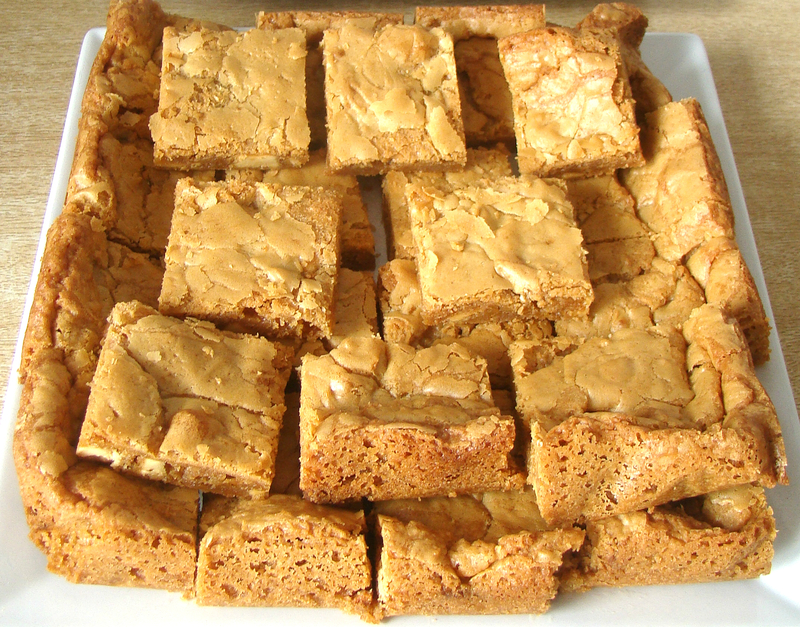 Allow the blondies to cool completely- about 3 hours – before cutting into squares. Makes 16 blondies. Recipe may easily be doubled and baked in a 9×13 pan for 35 minutes. 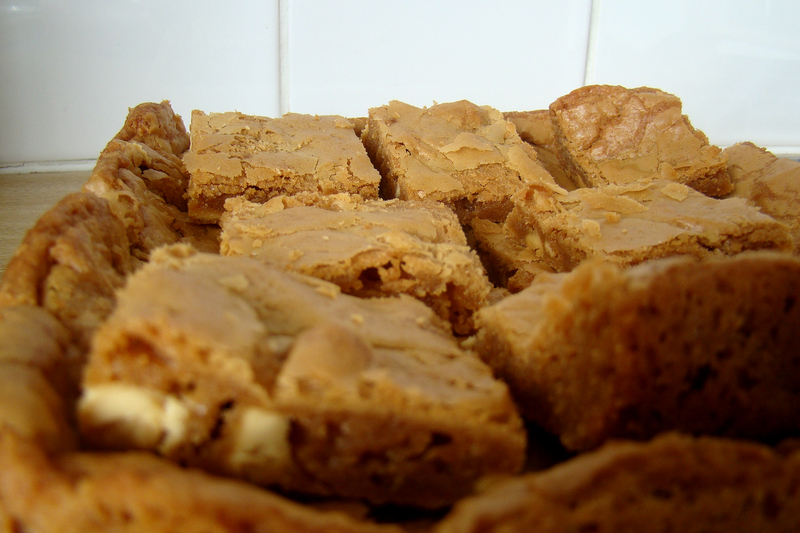 Blondies stay fresh at room temperature for 1 week. Enjoy these little pieces of magic! The rest of my link parties can be found here. These look great Sarah! Yum! Oh how I love blondies, these sound amazing! I’ve never used cookie butter, I need to give it a try! I have yet to catch the cookie butter bug, but these blondies look AMAZING! I may have to break down and buy jar. YUM! Yum Sarah, hooray for you and I love your blondies. Can’t wait to see what you bring next week to FF. Good to know Sarah… zero healthy recipes, I’m in the same mood! Your blondes look amazing and super yummy… that’s what I need! My husband loves blondies! I’ll have to make this for him for Valentine’s Day. He’ll be so happy. Yum, these totally look like little pieces of magic! I’m a huge fan of blondies and brownies – can’t wait to try them out. Pinning/stumbling! Yummy!…blondies and ice cream…best thing ever! Sarah, these are amazing! I am just drooling. Oh I absolutely love blondies!! These look so delicious! I was just at Trader Joe’s too…next time I will have to pick up cookie butter! ooh la la now i am drooling these look amazing and thank you sooo much for briging them to tea time. I am the same for the Fiesta Friday, sadly, I have been to every one since the beginning but i am just not an appetizer nor cocktail person really and can’t justify going out to buy extra stuff, what a shame. Ooh I need to get my hands on some cookie butter, because I NEED to make these! They look so yummy! Sweet is definitely my specialty too, so for the first half of the party I’m gonna be making a chocolate themed cocktail haha! Looking forward to seeing you there either way! Oh my goodness — what an AMAZING dessert. LOVE this recipe. 🙂 I don’t think that I could eat just one (or two…) though! Oh, these look so moist and delicious! Anything with cookie butter is on my to-eat list 😀 The weather here in Munich is just so cold and gray, I could go for a little batch of blondies to add some sun to my day 😀 Thanks!